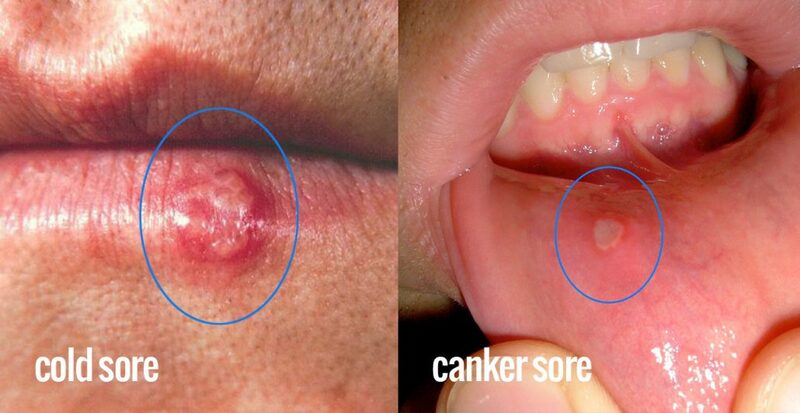 Cold Sores Vs. Canker Sores. How to tell the difference between the two. It is important to know the difference between cold sores vs. canker sores because the treatment methods are very different. In addition, cold sores are contagious and people need to exercise caution to prevent spreading the infection to others. Cold sores can also lead to secondary infections and be dangerous to people with weakened immune systems. In very rare cases the virus that causes a cold sore can lead to a severe brain infection known as herpes simplex encephalitis. There are ways to determine what people are suffering from when a sore appears. A proper diagnosis makes it possible to choose the best method of treatment. 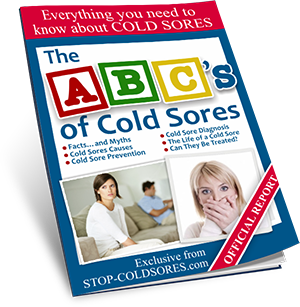 When identifying cold sores vs. canker sores, it is more common for cold sores to be on or around the lips and cankers to be in the mouth, but both can grow on either spot. They are both often triggered by stress, illness or hormonal changes and may appear when cold and flu symptoms are also present. Each may start with a slight tingling or burning sensation and tenderness in the area before they develop into the sore. The sores will generally last 1-2 weeks before fading away if they are not treated. It is possible to tell the two apart by examining them closely. Canker sores are white or gray open sores that are rimmed with a band of red. Cold sores are red blisters that contain fluid. After a few days the blisters will break open or weep and turn into a crusty yellow sore that slowly dries up and flakes away. Multiple canker sores may appear at the same time, but they will typically be individual blemishes. Cold sores often appear as clusters of small blisters. Most canker sores will heal faster if the sufferer performs regular salt water rinses or uses an over-the-counter medication. Chronic sufferers should avoid spicy or acidic foods, take a multi-vitamin or folic acid supplement or increase their intake of iron-rich foods. Cankers are not dangerous, but repeatedly experiencing sores could be a sign of an illness like Celiac or Crohn’s Disease. Contact a doctor if dietary changes and stress management techniques are not helpful. Cold sores are caused by the Herpes Simplex Virus (HSV-1). It is important to be cautious when they appear because this is a contagious virus that will remain in the body after it is contracted. People should avoid touching the sores, wash their hands frequently and not share utensils or drink containers during an outbreak to prevent the spread of the infection to others. Treatment after a cold sore has appeared is generally ineffective. The better option is to prevent it from developing. When a tingling sensation begins or a small bump appears anyone concerned that an outbreak is imminent should consider using The Cold Sore Inhibitor. These products help the immune system to stop the sore from forming. The system must be used early on in the development of the sore in order to be effective.